I sing with babies, toddlers and preschoolers almost everyday, and one thing I understand as a music teacher is that there is one serious deal breaker to learning music: that is the inability to feel a beat or the failure to understand rhythm. Because I have the privilege of singing with babies, toddlers, and preschoolers, I have made it my goal to make sure that every baby, toddler, and preschooler learns to feel rhythm. You will notice that I said “feel.” I didn’t say, “understand.” That comes later. Babies will not understand the rules of timing and meter, but they can and will learn to feel rhythm in my class. I will describe what I do to accomplish understanding of rhythm at each stage. Babies are fun. When I teach babies rhythm, it does not look like I’m teaching at all. I am sitting on the floor with my rhythm guitar strumming, singing, and tapping my feet which have foot tambourines on them to really emphasize the rhythm of my songs. My body is often moving to the beat of the song and sometimes I will actually count beats out loud. With babies, I choose to sit with them most of the time so that I am at eye level with them. I put instruments out in front of those babies so that they will have things to enjoy trying to figure out while I’m playing and singing. While this is happening it is amazing to watch those babies move, dance, clap, try to pat drums, shake rattles, sway, or sing. I never cease to be amazed at the elation and joy that music brings to babies. I always praise the mothers and fathers for seeing and understanding how valuable music is to their babies. 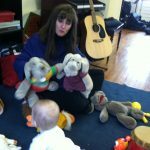 Bringing your baby to a group music class is invaluable in this process of beginning music education. I have yet to see a baby who does not completely enjoy being around music. I must point out that every child who started in my babies music class shows a complete understanding and feel for rhythm when he has finally moved to my preschool class. For my toddlers, I can start involving them in the music. I will sing songs that invite them to move, dance, stomp their feet, clap their hands, jump up and down. Now they are physically responding to the beat of the music. I still do not use any formal training with music notes on the staff, but at this stage they will hear me count beats out loud in the song. For all children, teaching rhythm through body rhythm is very valuable, but for toddlers, it is the primary and almost only method I use. I have a 45 minute toddler class and most of the class involves them watching me, mirroring me, or following my instruction. (This by the way is invaluable preparation for school as I have pointed out in one of my other blogs.) Many of the songs you will hear me sing I have written just for this purpose and you can now find these songs on my two CDs, Dance with Me: Songs for Young Children and Color Songs: Songs for Children. Now, I no longer sit at eye level the entire time. I am up and moving and having them move with me. They love the dancing and movement. We use sticks and scarves and body movements to work through other songs. At the toddler level, children are still learning to feel the music. Studies are now proving that play is the most important way for young children to learn, and this principle is clearly applied in all of my music classes for young children. If it isn’t fun, learning will not happen. My toddlers, frequently beg to come back. Parents who consistently bring their children to my music classes are laying a solid and strong musical foundation as well as a foundation for all learning. What looks like fun in our eyes is the most serious of learning for these toddlers. Now that the foundations have been laid (through my classes or listening to music at home) we are finally ready to begin the most basic of formal music education. We are still by no means going to get very detailed or technical, but we do start formally counting beats with sticks, drums and body movements. Not only are we learning basic beginner principles of music, we are preparing for reading. I have children placing notes on my felt music staff and I even have them practice drawing these notes on my enlarged musical staff worksheet that I hand out. This is not just good for learning music, but it is also good for teaching them to read and write. We are working on drawing from left to right. There are just so many wonderful activities that we can do with preschoolers to teach them to get the skills necessary to learn to read and play music. I get specific about many of the activities that I use in my other blogs. Check them out! Even in my preschool class, I still include my fun movement activities that were present throughout my toddler class. A few movement activities is a great way to start my class before we start working on the more formal learning. I encourage every parent of young children to find a good music class and enroll your young children in these classes. These classes are so very valuable to children’s growth and development, not only musically, but in many ways! Stick Activities with Toddlers and Preschoolers Meet Dennis!